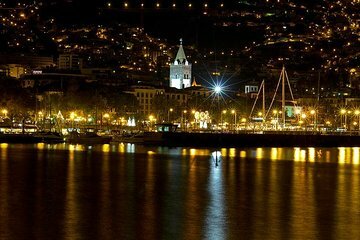 Découvrez les traditions culinaires et culturelles de Madère de nuit au cours d'une excursion de 3 heures avec dîner et spectacle à Funchal. Découvrez un spectacle « Bailinho da Madeira », présentant des chanteurs, danseurs et costumes portugais, et profitez des spécialités locales telles que des brochettes de bœuf et des pains plats. Puis, faites un arrêt à un point d'observation surélevé à Funchal pour une vue panoramique sur la ville. Le transfert depuis et vers l'hôtel est inclus. Venue is not appealing and has no atmosphere. We were supposed to attend the one in Funchal but they took us out of the city. We felt that it would have far improved our evening if we had been seated near some English people or at least some people who could understand English. Also very disappointed that the entertainment was not running all the time and there were large gaps with soft music you could hardly hear. There was only one dance for all to join in at the end which was just not enough to enjoy oneself and we were herded back on to the mini buses. It took a huge time for my friend to be given a fish dish that was requested on the booking form, and we had to still ask for. There was no visit to a view of the city on the way back also. Just not enough fun laid on! disappointing.